Jiu Jitsu is a battle in the mind. With assumptions about your opponentï¿½s reactions, we plan our game around a series of mathematical probabilities that are developed through years of training. If you could look into my brain during a fight, you could view 10 battles 2 seconds in the future at any time. With only one actual outcome, you have to decide which direction your opponent will go before he starts moving. I can assume you will move a certain direction based on the action that I take, but I canï¿½t guarantee this. If, in one second, I know of 3 potential reactions you can make and 3 reactions off of each of those, the number of potential fights I can view in my head will stifle all but the greatest Jiu Jitsu minds. All of these assumptions are catalogued in my brain, along with a probability tree, pulled at a split secondï¿½s notice to counter my opponentï¿½s movement. If I grab for your leg and you take your leg away, what moves did you give me? Jiu Jitsu is the ability to use your opponentï¿½s perceived movement against him even though we canï¿½t see this in advance. The picture is in my head because I have seen the reaction previously. 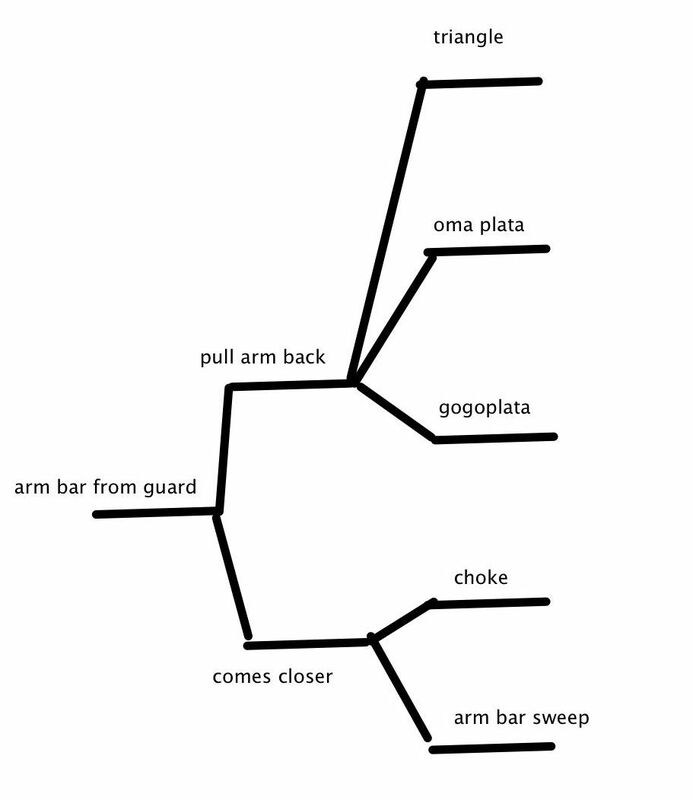 In this reaction tree my first movement is the arm bar from the guard. My opponent may try to pull his arm back or bring his arm closer to defend. Based on his reaction, I have 5 other options that I need to call on in a split second. This entire action tree might play out in 2-3 seconds. Letï¿½s say the probability of hitting the armbar is 50%. The probability of chaining together the armbar with any of the secondary moves increases to 75%. As I chain more moves together, it is less likely that my opponent will follow the pattern and make the appropriate counter. In 1996, I graduated with a chemical engineering degree. Chemical Engineering is the study of reactions on a molecular level that we canï¿½t see. Diffusion, heat transfer and fluid flow happen on a microscopic level. If I develop a model for 2 molecules that react under certain conditions, I canï¿½t see this happening. I have to make a picture in my mind and develop a mathematical representation for the chain of events. In this way, chemical engineering and jiu jitsu both start with a vision in my head. The more complex variations I can catalog in my brain, the more probable my chances of staying ahead of my opponentï¿½s decision tree. If I have a move that works 30% of the time I will not use it in a match. These are low percentage moves. The competitor that keeps him or herself in a high percentage or high probability position throughout a longer period of the fight give themselves a greater chance of winning. Now we just have to figure out which positions are high probability. When I talk to my guys about competition I tell them to rank all of their moves from 1-10. I tell them the only moves they will do in the match are the 9ï¿½s and 10ï¿½s. When I first start to learn a move, it is at a 1-2 level. It may takes months or years to get it to a 9-10 level. A move is considered a 9 or 10 if it works 90%-100% of the time against opponents at a comparable level to you. Their is a difference between training for competition and training to get better. When I train to get better, I work on all of my moves that are below 9. Maybe I have a move that is a 3, 5 or 7 that I want to develop and bring up to the 9 or 10 level. If Iï¿½m training for competition, I will only work on my best moves and the timing for those moves. I donï¿½t develop my game, instead I only get better at the same moves. Jiu Jitsu is a physical game that can be broken down into mathematical components used to our advantage. Champions combine physicalness with foreknowledge to stay a step ahead of competition.